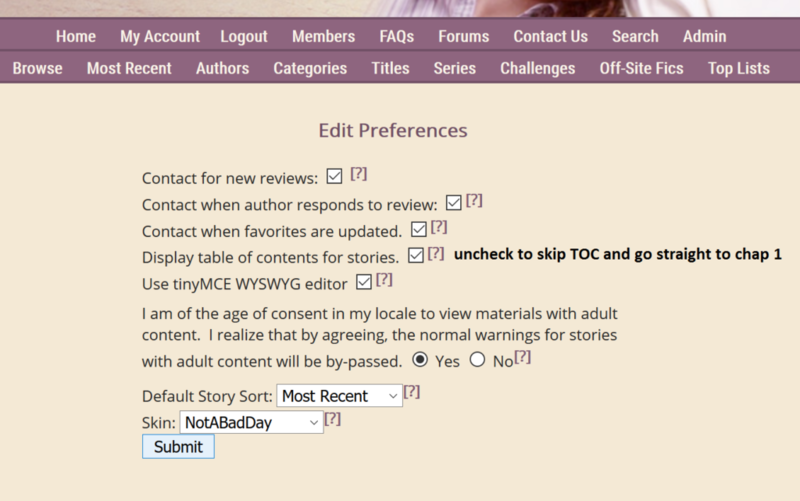 If you’re on this page, hopefully you are looking to register here at the MoreThanThat fanfiction archive. Registered users can add stories, leave reviews and jellybeans, save favorites and download EPUB books! Here is a visual guide to help you get registered and set up. Before we start: Registration will go much smoother if you add mtt@just-once.net to your email’s contact/safe list first. Passwords are sent to the email provided and this email often gets sent to spam or not delivered at all! Again, save the hassle and add mtt@just-once.net to your contacts first! So first, go to the Archive Registration Page, and take a moment to read the Terms of Service. The TL;DR version: you are responsible for what you choose to read, and you are agreeing to not be a jerk (including not plagiarizing other people’s work). Now you can go log-in to the archive with your penname and password. Once logged in you will be taken to My Account. The two areas you probably want to check out first are Edit Your Profile and Edit Preferences. 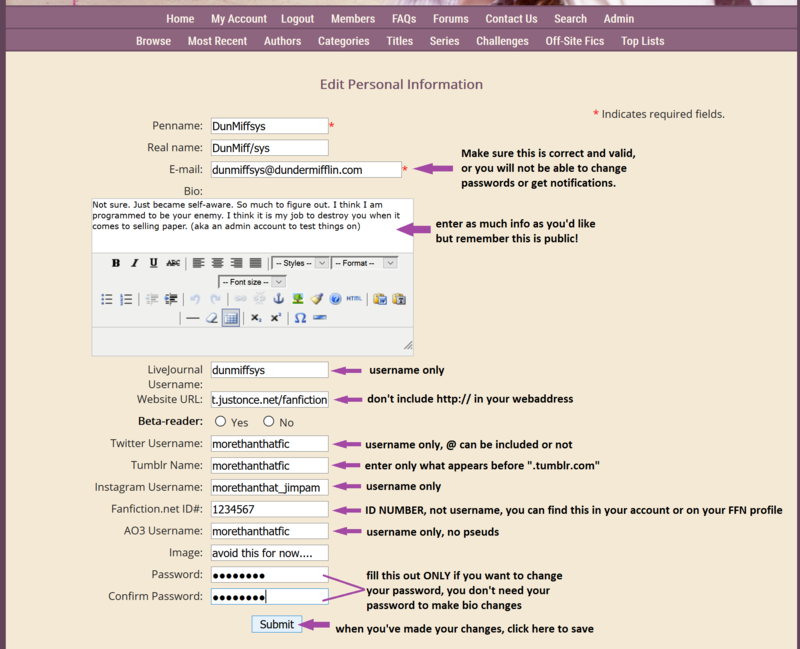 “Edit Your Profile” is where you can change your account email (it will not be displayed publicly) as well as your password. Users cannot change their own penname, if for any reason you do want to change your penname, while logged in head to Contact Up and send us a message with your preferred new penname. In general we will change your penname once, but if you're requesting a penname change very shortly after you registered and before you have submitted any stores or reviews/jellybeans, we may allow a freebie. Website: do not include the “http://” in your URL. Tumblr: type only what appears before “.tumblr.com” If you have a redirected URL, you can put that in the website field. Note: Though it says "Password" at the bottom of Edit Your Preference, you do NOT need to fill it out to made profile changes. You should only fill out the password fields in Edit Your Preference if you want to change your password. 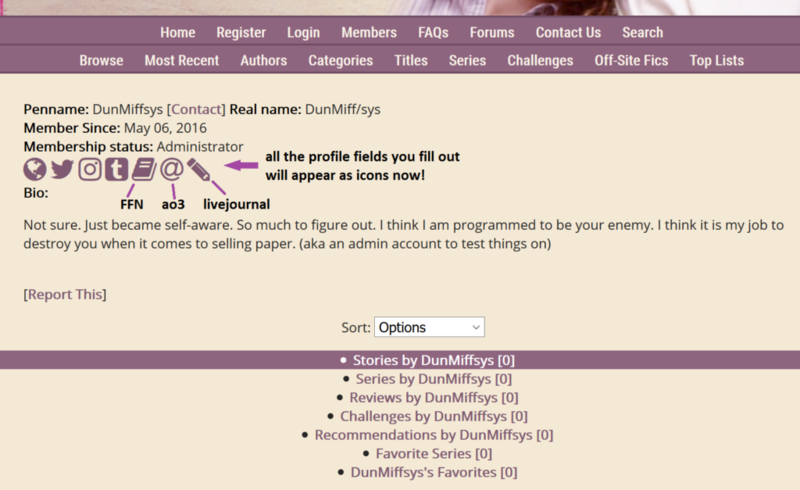 Now whatever profile fields you fill out will appear as stylish icons! And that's about it for "Edit Your Profile"
Edit Preference is the other section in My Account that new members should check out. It's where you can choose what kind of notifications to receive and how you want the archive set up for you. best to leave the “use tinyMCE” option checked. You can bypass the Adult Content warnings by selecting "Yes", please only select "Yes" if you are the age of consent in your area. You can chose if you want to browse stories alphabetically or by most recent. You can choose the skin/theme of the site you want to display when you log in. And now you’ve registered, set up your profile, at set up your preferences! If you have any questions, send them on in via the contact form or email us a MTT.fanfic@gmail.com.